I got really touched reading this review, thank you Lira and Magnus Östnäs! Spanish podcast: at 1.45.00 aprox. Thank you for an awesome review! Tomajazz!! our music starts at 00:58:00 aprox and the review is in the beginning! Our second cd with Caius Cat Trio is now for sale in physical record stores as well as online, I’ve seen it in iTunes and Spotify so far! Thanks to Pedro Martinez Maestre, Raphael Nick and Gunnar Åkerhielm for the playing, Otto Niklasson Elmerås and Daniel Aldenmark at One Touch Edit music production for recording, Pawel Lucki for final master, Jorge Ochagavia and David Delgado for Cover Design, Daniel Lantz and Do Music Records for Record Labelling and all friends and family supporting us! The CD’s have arived and we’ve been starting to ship it around the world, to prepare for the official release the 13th of November. I will also update this space when it is available in online shops. Young Swedish-Spanish-Swiss jazz trio Caius Cat Trio launch their self-titled debut album, packed with their unique, imaginative music, which tends to let traditions of jazz break new ground. Oskar Forsberg is the inspired tenor saxophonist from Sweden, schooled in the playing of Sonny Rollins and John Coltrane, who challenges his roots in experiments with novel harmonic and improvisational soundscapes. Spanish bass player Pedro Martinez Maestre, located in Switzerland, secures the groove and provides this airy trio with the requisite harmonic energy usually called for by the piano or guitar. Finally, Swiss drummer Raphael Nick showcases his versatility as an expressive and intuitive musician, setting the framework for the exciting sound of the trio. 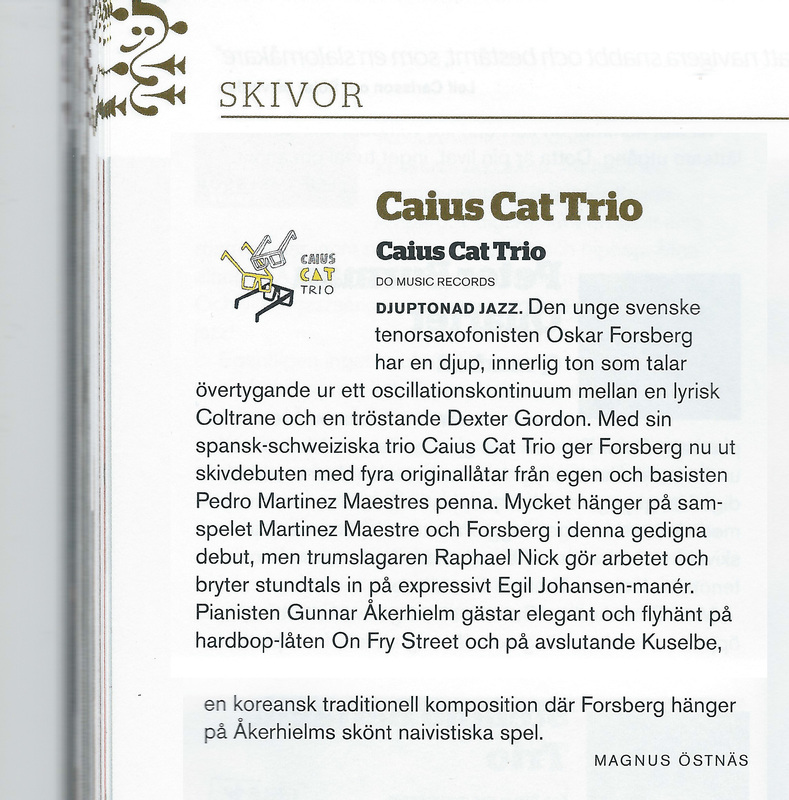 As a special treat, Caius Cat Trio introduces the skillful Swedish jazz pianist Gunnar Åkerhielm on a couple of tracks. This group presents some exhilirating music, constantly with one foot in the past, and the other in the future. Recorded by Otto Niklasson Elmerås and Daniel Aldenmark at One Touch Edit Studios in Stockholm in March 2014. Mixed by Oskar Forsberg. Mastered by Pawel Lucki. Produced by Caius Cat Trio. Executive production by Daniel Lantz. Official release date: November 13 2015. Total time: 50 mins. approx. will be released on DO Music Records probably already in October this year! It is the material we recorded in One Touch Edit over one and a half year ago, but with the help of a lot of people and a lot of invested time and money it seems as if we’re actually gonna finish this now. Caius Cat trio is the modern jazz (i.e sixties jazz with a bit of free/atonal too it) trio that I run together with my long time friend and colleague Pedro Martinez Maestre. This bass player and me met first in Texas in 2011 where we booth studied at University of North Texas at the time. Since Pedro moved back to Barcelona and then to Switzerland we’ve kept the project not only going but also accelerating. About two years ago master drummer Ralph Nick joined us and it was love at first note! We’ve been playing mainly in Sweden and Switzerland but also did a tour in Barcelona and another one 2014 in Alicante and Elche, where we was a main act at the Elx Jazz Festival! I believe over the years we’ve done around 50-60 shows. 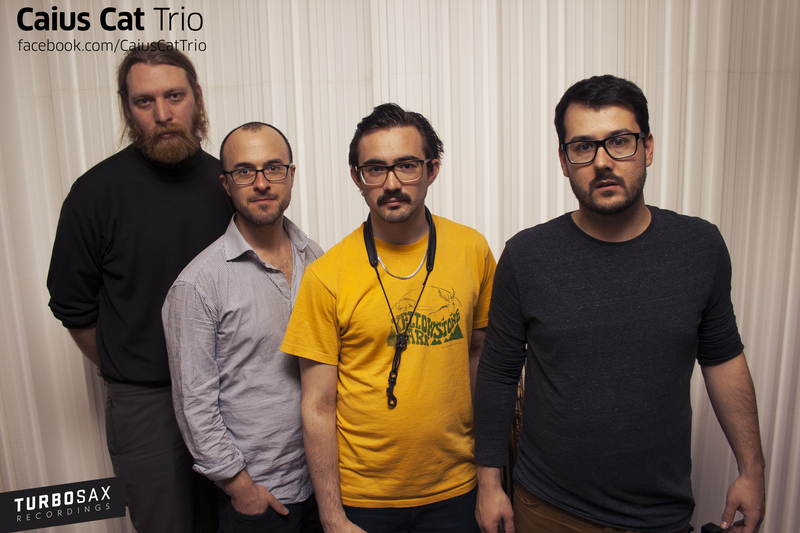 Which is not bad for a vocal-less jazz band that lives 2400km apart from eachother. Caius Cat in Sweden again! So Pedro was visiting me again in Sweden, this time with his cool girlfriend. We went kayaking, had a few drinks and did a really cool gig in Uppsala at Creperie Lemonie and another with great weather outside in Skansen, Stockholm at Gubbhyllan! We also did the annual Family concert in Linnés Sävja, playing music dating back to my grand-fathers father, grand-pa, dad, sisters and me! Pretty cool, but so far no photos. Though I am happy we all survived this the toughest test any family can go through. Two weeks ago I had amazing bassist Pedro Martinez Maestre visiting me and we worked hard with our Caius Cat project. This time with two (for us) new musicians, Jakob Hjalmarsson playing drums and AWESOME Gunnar Åkerhielm playing piano. Caius Cat just finished a week long stay in Alcant region of Spain with a big gig at Elche Jazz Festival! It was almost fully booked and Caius Cat Trio was the only band playing this evening, around 300 guests in this magnificent old castle. Here comes two awesome videos from Caius Cat in Sweden! ”Three years ago I had a discussion with Sam about Coltrane changes and some kind of practicing technique, I ended up spending 10-12 hours straight in the practice room rewriting ”On Green dolphin street” with some Coltrane Changes. I tried to play and record it with Se-jeong and maybe Felix too. Let it rest for a while and then we picked it up again withCaius Cat Trio (Me, Raphael and Pedro) some months ago. While this awesome gang was here almost two weeks ago we were practicing and playing around the clock to prepare for our big recording session. This video is from our last day before hitting the studio. If you care about me or see me as a friend I’d say you should watch it. I’m proud of what I’ve learned so far and I love playing with this guys and how it all sounds, and I hope you’ll like to take part of it! Final recordings finished. Here together with Gunnar Åkerhielm that got in on two of our tunes! Post by One touch edit studio. With the longest rehearsals we ever had, gig every evening and lots of preparations for the first long studio day we’re pretty tired at the moment in Caius Cat. However I am at the moment at Stockholm Youth Jazz festival playing with my students in Uppsala Musikskolas Storband. Tomorrow is gonna be competition playing with the big band and then back to the studio the rest of the day and night. So for now, I am finishing with a picture borrowed from my friends at One Touch Edit! Caius Cat in Sweden and the studio! Just got back from a little vacation with some rehearsing with Caius Cat Trio for the upcoming gigs at St Clara (26/3) and Hijazz (27/3) plus studio recording next weekend in One Touch Edit‘s studio. I am really excited about that, especially the recording sessions that’s gonna be awesome! Scheduling will be busy though, Pedro and Raphael are gonna be here for five days and then there’s the ongoing Stockholm Youth Jazz Festival where one big band I’m co-teaching will participate and try to win this year as well! See Uppsala Musikskolas Storband. Then this crazy Swede came and told jokes before he quickly left again! I also got to see my dear friend and master saxophonist Gerry Limon Lopez! I am currently working really hard to get all projects ”a float” and running. It’s a busy job setting up a Record label, Turbo Sax, as well as record, mix and produce your own recordings. We have got a tight deadline with Caius Cat trios first official record coming out in March, with a small release tour in Sweden. But already before that, before anything, I am going back to Switzerland to play a couple of gigs next week with the band. See the gig list below. I am very very excited about this week, I can’t wait! Then we got our first international gig with SZ Conspiracy, playing at Kayak Republic in Copenhagen 21st of February! Caius is also having a residency in Barcelona first week in May, I can imagine that will be a blast! In the meantime I am also teaching another semester, at the moment five days a week. We are in the planning of a workshop here in Uppsala for all interested music lovers, but more info will come when it’s official. Thanks to my dear friend Johan that showed me Photoshop and made a graphical profile for me my work comes out a bit nicer, don’t ya’ll think? This is our take of Pedro’s ”Sketches” from our show in Lausanne 28th of november. It’s a long sax intro, and judging by my mate’s faces, they wish it was shorter. Or maybe they just wanna play? This is how we looked at Blew Note in Lausanne yesterday evening. First we did a short recording session and later we did the concert with another session. 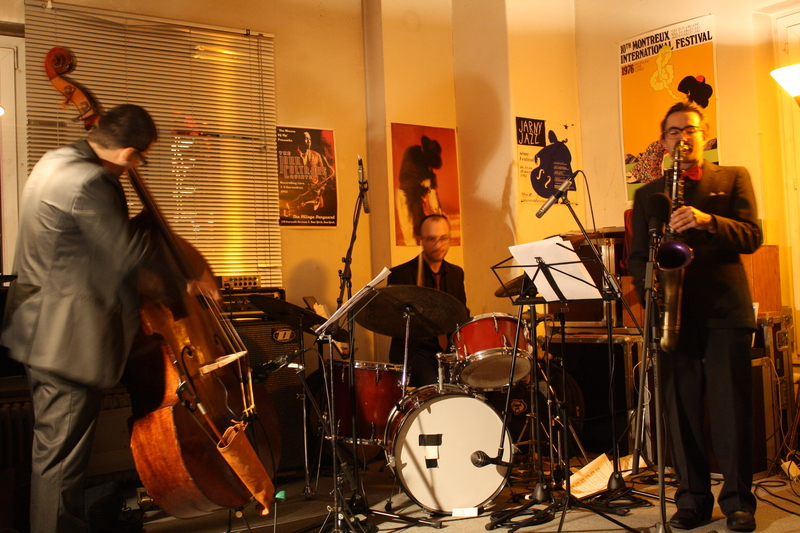 I think it was a nice gig and hope to have gotten some nice material for the upcoming cd!